The DNA of a 1st century shrouded man found in a tomb on the edge of the Old City of Jerusalem has revealed the earliest proven case of leprosy. Details of the research were published December 16 in the PloS ONE Journal. The burial cave, which is known as the Tomb of the Shroud, is located in the lower Hinnom Valley and is part of a 1st century C.E. cemetery known as Akeldama or 'Field of Blood' (Matthew 27:3-8; Acts 1:19) - next to the area where Judas is said to have committed suicide. The tomb of the shrouded man is located next to the tomb of Annas, the high priest (6-15 C.E. ), who was the father in law of Caiaphas, the high priest who betrayed Jesus to the Romans. It is thus thought that this shrouded man was either a priest or a member of the aristocracy. According to Prof. Gibson, the view from the tomb would have looked directly toward the Jewish Temple. What is particularly rare about this tomb is that it was clear this man, which is dated by radiocarbon methods to 1-50 C.E., did not receive a secondary burial. Secondary burials were common practice at the time, where the bones were removed after a year and placed in an ossuary (a stone bone box). In this case, however, the entrance to this part of the tomb was completely sealed with plaster. Prof. Spigelman believes this is due to the fact that this man had suffered from leprosy and died of tuberculosis, as the DNA of both diseases was found in his bones. Historically, disfiguring diseases - particularly leprosy - caused the afflicted individuals to be ostracized from their communities. However, a number of indications – the location and size of the tomb, the type of textiles used as shroud wrappings, and the clean state of the hair – suggest that the shrouded individual was a fairly affluent member of society in Jerusalem and that tuberculosis and leprosy may have crossed social boundaries in the first century C.E. This is also the first time fragments of a burial shroud have been found from the time of Jesus in Jerusalem. The shroud is very different to that of the Turin Shroud, hitherto assumed to be the one that was used to wrap the body of Jesus. Unlike the complex weave of the Turin Shroud, this is made up of a simple two-way weave, as the textiles historian Dr. Orit Shamir was able to show. 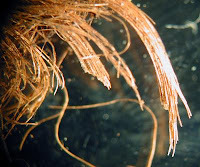 The excavation also found a clump of the shrouded man's hair, which had been ritually cut prior to his burial. These are both unique discoveries because organic remains are hardly ever preserved in the Jerusalem area owing to high humidity levels in the ground. According to Prof. Spigelman and Prof. Greenblatt, the origins and development of leprosy are largely obscure. Leprosy in the Old Testament may well refer to skin rashes such as psoriasis. The leprosy known to us today was thought to have originated in India and brought over to the Near East and to Mediterranean countries in the Hellenistic period. The results from the first-century C.E. Tomb of the Shroud fill a vital gap in our knowledge of this disease. Furthermore, the new research has shown that molecular pathology clearly adds a new dimension to the archaeological exploration of disease in ancient times and provides us with a better understanding of the evolution, geographic distribution and epidemiology of disease and social health in antiquity. The co-infection of both leprosy and tuberculosis here and in 30 percent of DNA remains in Israel and Europe from the ancient and modern period provided evidence for the postulate that the medieval plague of leprosy was eliminated by an increased level of tuberculosis in Europe as the area urbanized.